CG30,31 is a cometary globule complex located in southern portion of the large Gum Nebula at RA 8hr 08min 50.5s and DEC -35d 50m 54s near the constellations of Vela and Puppis. 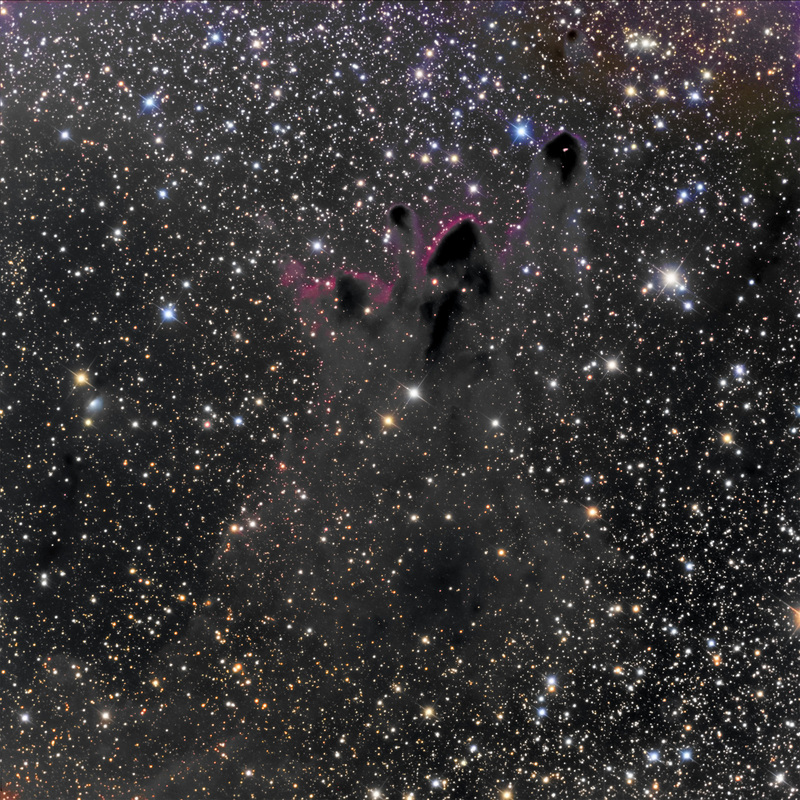 Unlike the more famous nearby, cometary globule CG4, this is a complex of several globlues (CG30, CG31, CG38) and dark clouds. An annotated image is presented below (note – the main image is rotated 180 deg). The head of CG30 contains the bright Herbig-Haro object HH120 that is powered by a young star, CG 30-IRS4 based upon IR data. Distance estimates are 700-1300 light years. The image is ~42′ x 42′ and North is down. 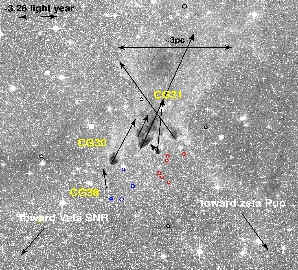 Ref – B. Pettersson, "Young Stars and Dust Clouds in Puppis and Vela", p 54 in Handbook of Star Forming Regions, Vol 2. The Southern Sky, ed. B Reipurth, Astronomical Society of the Pacific, San Francisco, 2008. 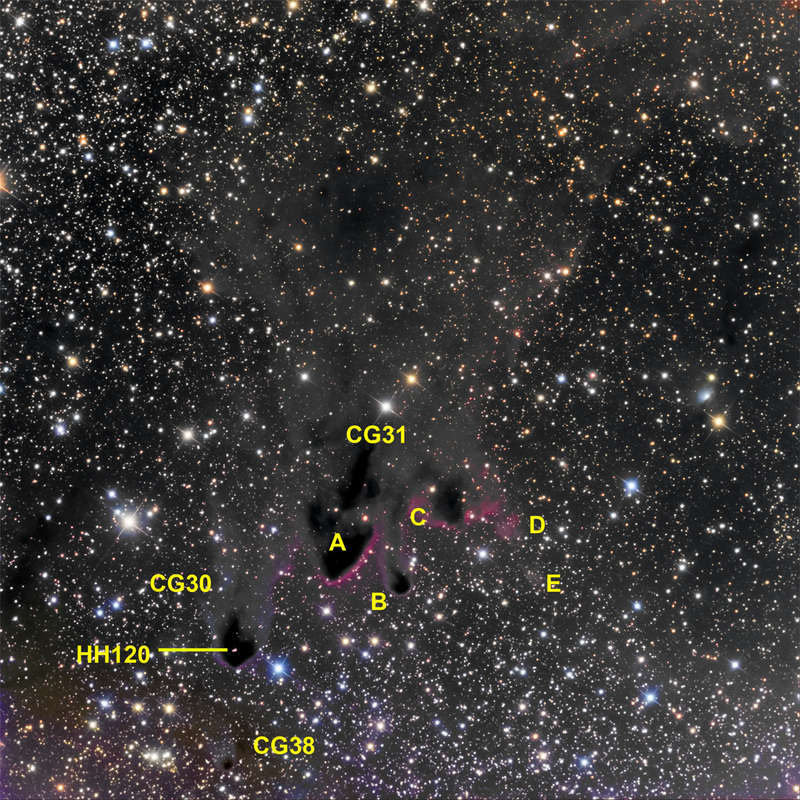 The tails of these cometary globules point away from the Vela supernova remnant and zeta puppis and may have been affected by zeta puppis in the last million years. My data were acquired automatically with CCDAutoPilot4 running Maxim4.62. The system was guided with an SBIG ST-402 on an Astrodon MonsterMOAG. Astrodon Generation 2 LRGB filters were used. Data were calibrated and processed in CCDStack and Photoshop CS3.